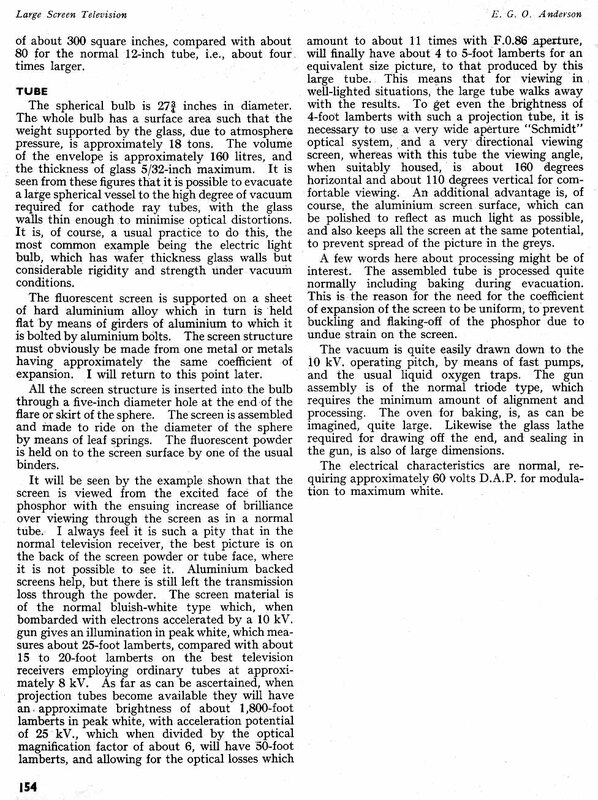 1947 Baird Large-Screen Direct-View Television Set! 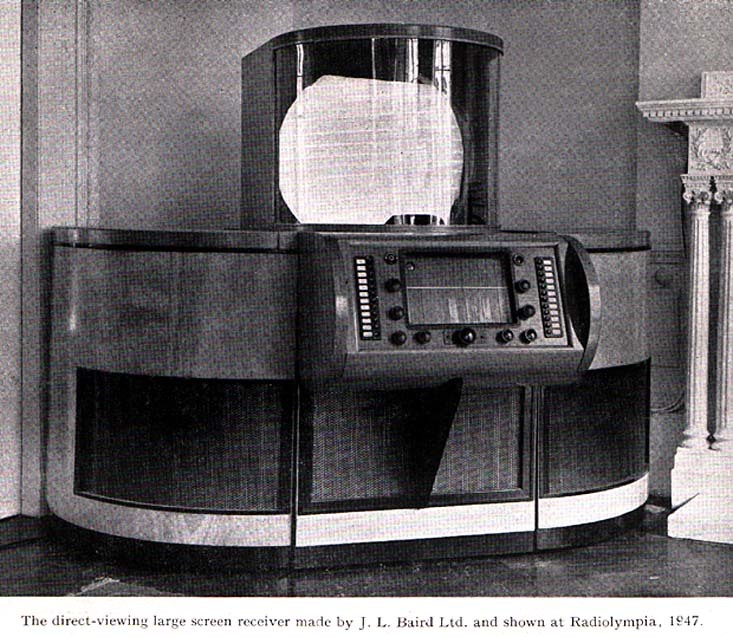 (134K) - Read the story behind this amazing one-of-a-kind British television set, as told in the March 1948 issue of the "The Journal of the Television Society", from London, England. 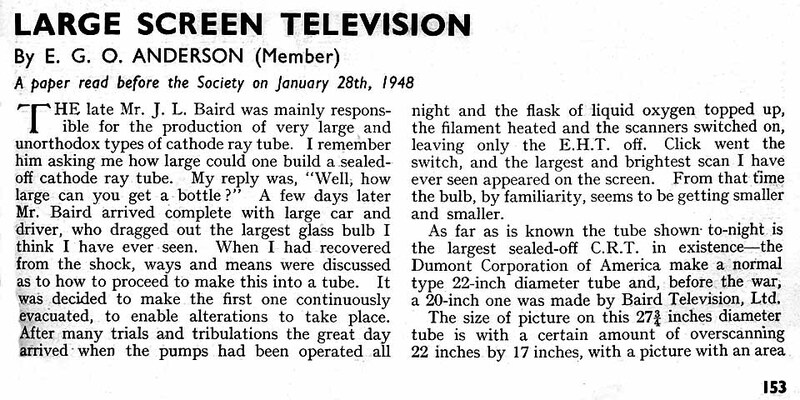 (328K) - Continuation of story about the design & manufacturing of this enormous picture tube. About 44,000 TV sets in the US, vs 40 million radios. May 7th -- Kraft Television Theatre starts on NBC, becoming the first commercial TV dramatic series. September 13 -- Kodak and NBC develop " kinescopes ", which are the use of a special film camera to shoot directly off a TV screen. This permits the recording and later distribution of live shows for sale, or archiving. September 30 -- First telecast of a World Series game. NY Yankees vs. Brooklyn Dodgers. October 5th -- Harry Truman becomes the first president to make an address to the public on TV from the White House. He discusses the international food crisis, proposing meatless Tuesdays. November 6th -- Meet the Press premieres on NBC's local Washington station. Went network on Nov 20th. December 29th -- Howdy Doody Time begins its first broadcast on NBC. We designed pink ladies jacket and kid gloves for different purposes like style, fashion and especially for comfortableness. Our snowboard gloves are now vacant on our site Behind this our high quality 640-721 Practice test provide you definite guarantee for passing the 70-515 Practice test that enhance your credibility and learning power.